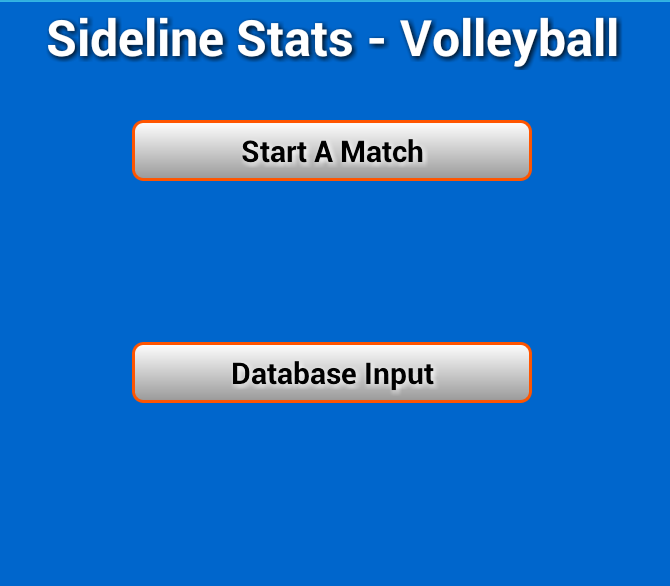 Starting a match: When a team has been created in the database, you will be allowed to start a match. 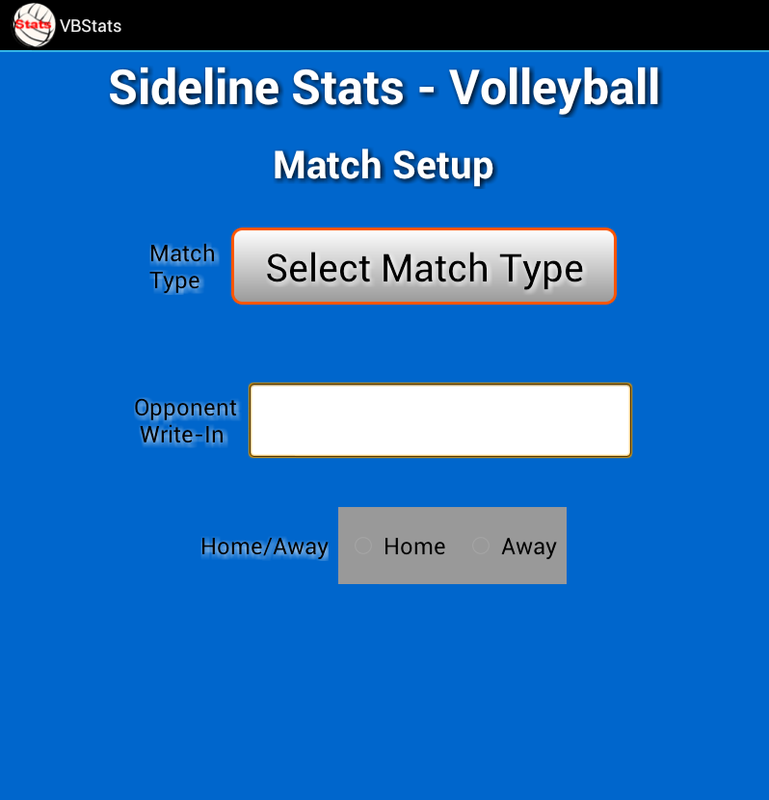 Pressing the ‘Start a Match’ button in figure 1 will take you to the Match Setup screen (Figure 2) that will allow you to define the match being played. 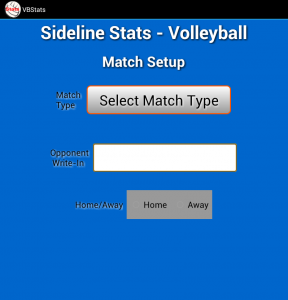 This screen allows you to define the type of match from the list of match type provided. An opponent write-in space is provided to add the name and level of the team you are playing. If prior matches were inputted, a list of prior opponents would be provided, so that you could choose a prior opponent. The opponent write in should be inputted in the format of “name-level”, leaving out the quotation marks. Next indicate whether this is a Home or Away game by selecting the proper radio button. Once all the information is entered a continue button appears. Press this to continue once all data has been verified. 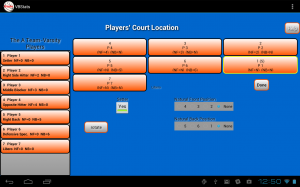 After putting in the basic match information its now time to place the players on the court where they are going to start playing. Figure 3 shows the list of players on the bench and court positions. Although each player has a position defined within the database, any player can be put anywhere on the court. The Libero position has its own position. This position is used to denote which player is playing as the libero. Up to two liberos can be assigned. From the list of players on the bench, select the player that is going to start the match. The player will be highlighted. Next select the court position this player will start in. Repeat until the court is filled. 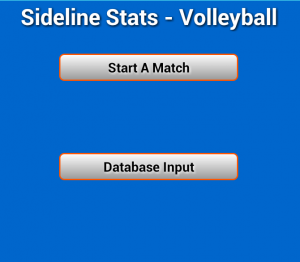 If a player is to be your setter, select that player on the court and indicate via the toggle button this player will be the setter for the start of the match. By selecting the player on the court you can change the natural position this player will play. If a player is going to be your libero, you need first to assist this person to the libero position. When your all done, your form should look something like Figure 4. Once the main court is filled, the “Done” button is displayed. Pressing this button will complete the court assignment process. Saving /Retrieving Lineups: To facilitate court assignment, a save and restore function is provided as a menu option (see figure 5). Selecting the ‘Save Lineup’ option will provide you the dialog to enter a file names associated with this particulate line up. On the court assignment screen a “Rotate” button is provided to rotate the players positions so that from a basic lineup alternate lineups can easily be created and/or saved. The “Retrieve Lineup” option provides any lineup that was previously saved for this team, making it very easy to make the court assignment for a team that has a standard starting positions. The “Rotate” button is also very helpful in finding any natural position conflicts. If a conflict exist. a pop-up message is generated indicating a conflict. Conflicts are just a warning message that two or more players are going to attempt to move to the same natural position once play starts. The program will arrange players with conflicts, but the final placement might not be what is desired. Natural position conflicts should be resolved to avoid inappropriate placement. Rotation and Who Serves: The final activity is to define what rotation the current lineup is in and select which team is serving (see figure 6). 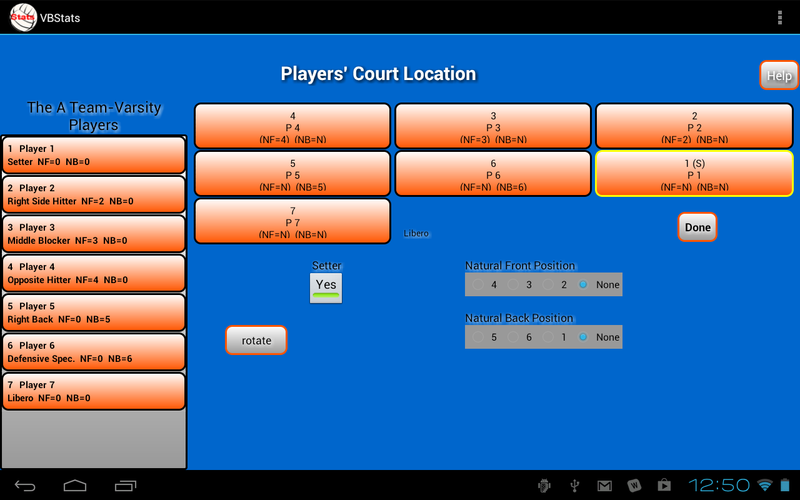 The rotation is automatically assigned to the setter’s position, but this can be changes to whatever you prefer. Once completed, press ‘Done’ to start inputting players actions. (See “Stat Inputting”).